Lemon Grove Farmhouse & Ivy Cottage are located in a great position in a beautiful spot amongst the Lemon Groves. 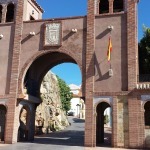 It is situated between the Villages of Benamargosa and Riogordo, in a quiet location. Between the Farmhouse and Cottage it can sleep 16 people. Lemon Grove (Limonero) is a beautiful, old typical Andalusian country property. Set in the hamlet of Llano Almendra in Comares, it is surrounded by mountain views which protect us from those windy winter days therefore making it quite a sun trap. Secluded, peaceful and a haven from city living. It is one of the oldest properties in the area (dating back some 300 years or so), tucked down a small track leading away from the edge of the village to a river bed (which in the summertime is dry- and is used by the local shepherd to walk with his goats). The characterful property overlooks the fantastic orange and lemon groves peppered with avocado trees too. The citrus smell of the grove is part of the charm of staying at Lemon Grove. Having been a family home for many years for Avra, Wesley & Sophie it has been sympathetically restored and updated whilst keeping its original charm and character. Once through Lemon Groves’s gated entrance you are transported into another world. With three beautiful adjoined properties, each with their own character. Lemon Grove in days gone by was used for housing animals, storing olives, hay, and provided accommodation for the farmers and families. As you enter Lemon Grove for the first time, walk right along the covered airy patio (with pergola draped with wisteria and hanging vines) & check out the pool on your right down below, and the take in the views and scents of the groves. It is an ideal place to wind down. If you are looking for slick TVs and air conditioning, then this probably isn’t the place for you – but if you are ready to relax, get into exploring the local rural landscape and villages, sample the fantastic Andalusian food, cook with wonderful finds from the local shops and markets, and live at a different pace, then you will be right at home. There is a fabulous barbeque on the patio too. Listen out for the goat bells in the evening, and if you are quick enough, walk down to the river bed, and you will catch a glimpse of the herds of goats on their evening walk. It’s quite magical. If you come at the right time, you can just also graze on the hanging bunches of grapes. The beauty of Lemon Grove is its rural location and everything that comes with that, but at the same time having easy access to great local villages and landscapes. The local people in surrounding villages are very welcoming and will be delighted if you can (or try to!) speak some Spanish. The whole property is fenced and gated with parking outside for four cars. If both properties are used Lemon Grove has three bathrooms, three double beds and eight single beds. Sleeps fourteen comfortably. In addition there is a double sofa bed available in common spaces if needed, sleeping sixteen in total. There is a washing machine to the rear of the house. There is a fabulous old fashioned outdoor washing sink, drying lines and a drainer. The larger cottage next door has a lounge/dining area and kitchen and shower room and upstairs are 3 bedrooms, of which one is a double, another a single and the third a twin room. This wonderful and historic collection of buildings are all attached to each other and allow full flexibility in allowing family groups and friends to have their own space whilst being drawn together whilst having fun in the lovely pool or finding shade in the gardens and grounds or of course sunbathing on the pool terrace and the terrace that leads off from there. For eating outside the BBQ is just outside the farmhouse door, there are 2 large tables to seat a max of 20 guests and the lovely 8 x 4 m pool is down some steps and behind a locked gate, which really helps families to relax. Just down from Lemon Grove is the river, dry in spring and summer which is a fantastic natural play area for children and a great and different walking environment for adults, you can walk all the way down to the Mediterranean if the desire takes you and time allows. The whole set up is like stepping back in time with bread oven on show and mule tie rings still positioned in the exterior walls. Smoking is permitted outside only please. The whole interior has been lovingly restored and character kept but modern facilities added. Above Lemon Grove is one more cottage know locally as the chapel due to its styling, this is where Wesley, Sophie and Avra live with their dogs and 2 cats it is handy having the owners on site for advice and the odd bit of help that may be needed, but at the same they are not obtrusive, and are as discreet or as helpful as you require. Lemon Grove Farmhouse and Ivy Cottage are perfectly located to experience the rural element of Andalucia, in a lovely hamlet that has hardly changed since it was built 200 years ago.The whole area is steeped in Moorish history and the location allows you to switch between a relaxing environment and also within 30 minutes experience beach life, towns and tour the many beautiful white villages that surround this hamlet. 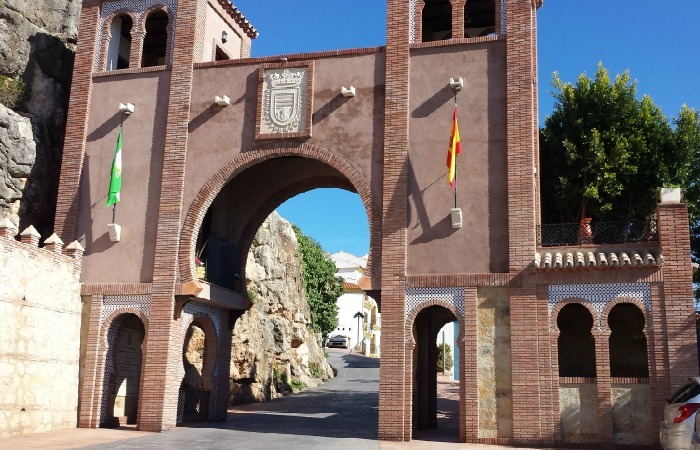 The walks in the local area are rewarding, especially spring and summer walking along the dry river beds which are just below the Lemon Groves but bird watching, fiestas and horse riding can all be part of the holiday agenda. The caves of Nerja and the pretty seaside village itself are only 45 minutes away, but this area of Andalucia still has coast line which is peaceful and spacious so if the desire is to also get away from the crowds then you will have picked the right place. Marbella with its glitz and port is only just over 1 hour away, worth seeing how the other half live and then coming back to the tranquillity of the grove. Also Gibraltar, Ronda and Seville are all reachable with 2 – 3 hours. The local bars are not tourist prices so you can still get a menu of the day for 5-7 € including 3 courses and a drink and bottles of San Miguel are only around the 1.20€ mark not bad for a trendy drink in the UK, wine is still great value and fresh fruit and vegetables though not as uniformed in shape as the ones for sale in the British supermarkets usually tastes better and is far cheaper. I arrived at Lemon Grove with my group of 10 last Saturday, my business is training potential Hospitality professionals so rented the whole place which is made up of three properties and so far has proven just perfect for our needs. Important for myself as a trainer to have a tranquil atmosphere in order for my clients to focus on the course at hand. Is this ever the place!! We never expected it to be such a quaint old property and so seeped in history. Sitting outside working in the mornings listening to all the Birdsong is just out of this world so calming peaceful and relaxing. We are self catering so in the evenings, after an intense day of training we sit out on the spacious patio BBQ just so chilled and relaxed, just looking at the night sky and discussing the stars as due to no light pollution they are so bright and clear. None of this has anything to do with the courses I am running but it certainly adds to it, by helping us to switch off and relax in between studying. I can fully recommend this perfect retreat. I will be booking to return again but next time for a holiday. I am looking into doing the diving course which is just one of the many courses or activities that lemon Grove host! So leaving on Saturday, still a few days left, be tough to go home after this, far too relaxed now! Lovely, peaceful location. Spacious and clean, nice swimming pool and gardens. Would recommend! A really wonderful place to stay. The farmhouse is within easy reach of places of interest although I could have easily just stayed at the farmhouse and wandered the local area. Wes was incredibly helpful especially when we couldn't find the property. My advice would be to like minded useless drivers would be to select economy route on the sat nav as opposed to the quickest route. A few tears were shed on leaving, the scenery, people and local restaurants were lovely, our daughter had said that it was the best holiday to date and I would second that. We had a lovely relaxing week at Lemon Grove with just a few days out. With chidren ranging from 3 to 14 years in the party, the pool was very well used and loved by everyone. Visits to Comares and Colmenar and a day on the beach at the reservoir near Iznajar were all the days out we needed. Relaxing by the pool and eating meals on the terraces was lovely ( the kitchen in the main house, where we did all our cooking was well appointed for preparing large family meals). Lack of light pollution and clouds was also great for stargazing. We were 19 people staying at Lemon Grove farmhouse. Family and friends together for two weeks. We loved the peaceful place, and enjoyed the pool as well as making fresh lemonade! The scenery is beautiful, and the host family extremely friendly and helpful. As much as we enjoyed Granada we enjoyed walking along the old road to Comares, and the friendly Spanish people we met. We have just returned from our stay at Lemon Grove.The farm house with its rustic charm and quiet location was a haven to just relax and chill out to our hearts content.Fresh lemons for our martinis and a large pool in which to cool off at the end of a hot day, was just bliss. I couldn't believe how our two weeks flew by. We went off 'exploring' in our hire car for a few days to the local markets and down to the coast but we were most happy staying put at Lemon Groves Farmhouse. Each morning i went for my half hour run up the deserted dry river bed in the cool of the morning shade and came back to a lazy breakfast of fresh fruit and juice on the terrace overlooking the lemon groves. Each afternoon we would read in the sun, cool off in the pool and then gin and tonic at 5.30pm in the warmth of the evening. The kids loved the good sized pool (so clean!) but also enjoyed finding baby turtles and frogs down in the stream below the house. We certainly didn't want to come home and would recommend this lovely house with its attentive but sensitive hosts to anyone looking for a quiet place away from the busy holiday scene amongst beautiful countryside. Picking lemons and medlars off the trees was a delight!